Ah, I had been waiting for this. Last year a Facebook challenge The Watercolor Snow Scene Festival cranked up and I wanted to paint snow I had actually seen and felt. I was in Alaska last year, but somehow southern snow what I wanted for this project. So, I waited. We got through January and nothing, (it is the south), and late in February finally some snow. For those of you who don't live in the south, our snow, if we're going to get it, comes in late winter. It's most common in March for some reason. Usually we just get a dusting if anything, but the last two years we've had decent accumulation. 5 inches this year. Nice for us and it's gone in a day or two. Everyone stocks up like we're planning for a nuclear winter then we play a sort of bumper car rally when people are driving around looking at the snow. Hint- just because you have an SUV doesn't mean the laws of physics don't apply. An object once set in motion wants to stay in motion, etc. SUV- more mass, you get the idea. We walked. Noelle made it to the end of the street, ran in to visit a neighbor and warm up, then made it another half block before deciding she lived in the south for a reason, that reason being she didn't have to walk around in any damned snow, and turned for home and a warming glass of wine. 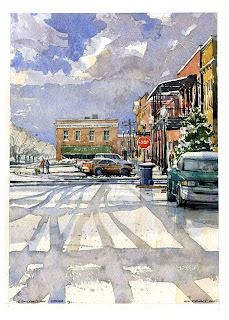 I joined our neighbors and we walked down town took pictures, tossed a few snowballs, had a beer in a deserted Opelika. We packed a couple of hideaways in case the coffee shop was closed. Here are a couple of my warm studio paintings of the day. Still working on a few more. The gal in the red jacket would have been Noelle, but my neighbor Audra braved the cold so she got the glory. It was a great day all in all. 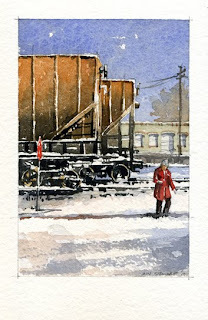 South Railroad Avenue 13" x 9"
Red Jacket 6" x 4"
Extraordinary work! I found you by way of a friend who shared your paintings on Facebook. I look forward to seeing more, absolutely lovely!